God was looking over the Earth, and he wasn't happy. Most of the intelligent people seemed to be heading towards atheism, and the people who were staying true to the faith were complete idiots and weren't making very good arguments. He sighed, and opened the heavens. "Good people! Oh... er... Well, People! You pretty much seem to be idiots. Since I am obligated to love you, and I promised not to, I can't kill you all in some giant flood. So I'm going to let you all kill each other, and I won't hold it against you. Go wild." Unfortunately, most of the world was drunk at the time and either ignored the message, or just posted it on the internet, where it was ignored. In 20 years, no progress had been made towards wiping out humanity (other than the usual wars and 'natural' deaths). 1. Anything out of the ordinary; any attack, any movement, any action, beyond something normal or what your current character could obviously do, should be checked out with me. 2. Godmodding is only allowed in select cases (See Advice). Even if your attack has no chance of missing, do NOT describe the carnage unless you've checked with me and/or your target. 3. Please do not pull objects from thin air. If I mentioned it or it would make sense in the situation, fine. No 'I grab a conveniently-placed *whatever*'. This also goes for calling in aid/air strikes. If it doesn't exist and has never been tied to your character, it's not coming. You can say you ask for it, but the next poster (probably me) has the right to tell you 'Nuh-uh' in whatever way they wish. 4. If you are Good, you can NOT kill innocent civilians or teammates. If you think a teammate might be an enemy in disguise, your attack must be non-fatal until you're sure. 5. Had a change of heart? Were you never really that 'Good' to begin with? Switching sides is fine, if you warn me ahead of time, but your new allies are not bound by any rules. They are within their rights to kill you. Watch your back. 6. Are you Evil or Neutral? Team Killing is A-Ok, just ask me first. However, this may make you a target for the REST of the team, and the person you killed will most likely come for you. 8. I will keep a record of used characters, who used them, and how they died. These characters are off-limits. 9. Anything that could destroy the world/universe/sun/anything of that caliber is off limits. Characters who have them are fine, but you can NOT use those skills. Also, for the sake of the game, anything related to other dimensions (other than having come from them) is also off limits. These tend to become the 'easy way out' for killing tough opponents. 10. Generic characters are questionable. A stormtrooper or 'That one guy from that one place' work, but 'A wizard from D&D' or 'a robot' is too vague. Try to be specific. 11. Damnit, Griffin. I said NO TARASQUE! (or anything even remotely related to it) This means no Superman, and try to avoid anything along the lines of Godzilla or the Rampage monsters unless you ask me first. 12. Also ask before using swarms or large groups of small critters. Large groups of large creatures are counted as individuals. I'm hoping this will grow slightly as more strategies are discovered in the game. -This game will be un-stickable. If someone holds up the RPing, they will die. If the game's been going a while and/or several people are holding it up, I'll nuke the place, and you all get a new setting! -If you decide to switch teams or you go undercover as an enemy team member (make sure any undercover dealings are cleared with me), act like the enemy! If you stick out, you're liable to wind up dead before you do anything worthwhile. All post in the actual game should probably be of you killing a different team, or you might just stick out. If you want to steal-kill, you can work it out with me and your target. -It is allowed and highly encouraged to look up your enemies on Wikipedia! Knowledge is power. They can't flaunt their strengths without exposing their weaknesses! -Research your OWN character as well. They might have powers and abilities you never knew about! This will house the characters of RP past. We will tell you who used them and how they died. These guys are off-limits. - A Mind Flayer from D&D - Uber - Killed by giant robot leg through the head by Griffin. - HELXAU-08-LUC-66 - Griffin - Wounded by Grey Fox (Sora), Finished off by God. - Grey Fox - Sora - Molten to death by HELXAU-08-LUC-66 (Griffin). - Ironhide - Uber - Smitten by God less than 10 seconds after appearing... pathetic. Note: Please post a picture and the alignment of your character on their first post, so we know what they look like and what side they're on. Even the obvious ones. The large city of Idontcareistan was still busy, even in the encroaching darkness. The sun lowered over the horizon, the shadows of the skyscrapers stretching ever longer over the nearby suburbs. The streets were filled with late-night commuters, and connected by a maze-like network of subways, sewers, and alleyways. A fitting starting ground for the massive wave of destruction that would soon hit the Earth. The Mind Flayer peered out from the dark alley. It was quite liberating to finally be free. To have free run of the world. Soon, these weak-minded fools would be empty-minded fools. The feast was upon him! HELXAU-08-LUC-66 was indeed, empty minded, or would be. If it had a mind. Its sensors suddenly picked up activity below it on the quiet rooftop where it was stalking prey. It climed down, so that it was on the wall of the alleyway. Its target appeared. It scanned. It fired several blasts of explosive hot plasma from its razergun at and around the target to confuse it and, in a flury of aggressive talons aimed to rip it to shreds jumped from the top of the alley to eliminate the prey. The Mind Flayer was thrown clear by the initial blast as the robot smashed where he had once been. People noticed this and began to run in terror. "Damn iron terror! You have frightened away my prey!" Searching for a mind in the monstrosity in front of him, but found none. "I... I cannot control you!" He stammered, backing away in fear. 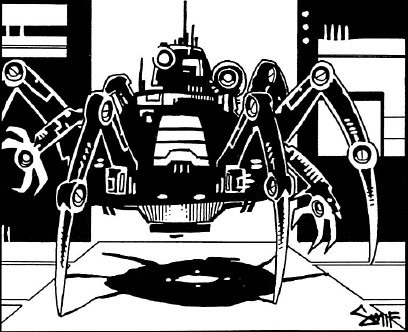 Sending a psionic blast into the screaming crowd beyond, several people stopped running and began to charge the robot, beating at it with their fists. The robots laminate armor broke the humans' fists as he cut through the crowd with his talons. "Please do not run, the world must be unified under the Zonemind. Your resistance and your type are the cause of war on this planet. The H-E-L Zonemind does not approve of genetically made life-forms. Please do not resist or return to the B-R-Z or C-A-D zone you are made in," came the happy, sweet, childish voice from inside the robot. Enough to put a smile on anyone's face as it cut through the guts of another human with its talons; bone and muscle flying through the air and splatting against onto the street as the bodies hit the floor. He continued to fire the razergun at the target, hot plasma blasting through the air. The Flayer ducked under the blasts, calling forward more humans, including a few policemen who had rushed to the scene. The readied their guns and fired. The robot was now surrounded by attacking humans and the guts of those who had tried before. Gunshots rang through the alley and connected courtyard. Amidst the chaos, the Flayer made a break for it down another alley and into a sewer through a nearby manhole. HELXAU-08-LUC-66 was initially displeased before its infrared scanner caught a single, moving target below ground. It blasted the cannon at a nearby victim, not only sending the target's and all those nearby's organs in every possibly direction but also creating a huge cloud of dust. Chameleon mode was engaged and it dissapeared to the crowd, sinking into the sewers himself with a clear focus on its target through various sensory systems and still invisible to common sight. Quickly, it engaged its maximum speed of 20MPH and closed in on the target as it began to assault it with a barrage of fire. Altair (assassins creed dude's, he is neutral) had fortunately done well of some citizens (save citizen quest LOL) that were near the man hole, they told him where the evil being had escaped. Altair dropped into the man hole and swung from the piping threw himself downward hidden blade protruding from his wrist, the shiny steel was aimed directly for the spinal column of the beast. Grey Fox (EVIL) materialized, seemingly out of thin air, swept his blade and deflected Altair's blade, and knocking Altair backwards. Grey Fox turned his attention to the robot, running past the mind flayer, Grey Fox jumped onto the top of the robot and raised his blade to slice it into the mechanics. The Flayer continued to run, pained. Two living minds had appeared, stronger and tastier than the civilians above, but he needed to keep running to avoid being slaughtered by them and the original menace that was the giant robot... Strange how easily it managed to fit into the sewers. Grey Fox plunged the sword into the robots metallic hull and sliced everywhere inside, attempting to disable the robot. Due to the fact that not only was the robot camoflauged, but also hidden from infra-red vision and made of armor not to be invented until a time a distant way after Grey Fox's life had ended which is sword was simply not designed to cut as easily, the blade missed the main chaissis and soon got stuck in the strongest material, near the leg joint. HELXAU-08-LUC-66 reached a talon up, grasping the sword with immense strength, easily enough to stop it moving, and turned the razergun towards the opponent's face before firing repeatedly. 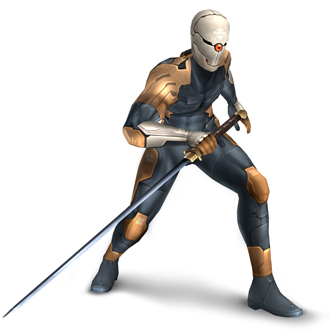 Grey Fox then initiated the electric shock in his sword, causing a massive amount of electricity to course through the robot. Grey Fox's cloak was running out of power, he jumped into a nearby tree, effectivly hiding from the robot while his shield recharged. Grey Fox moved away from the green tree spray painted on the sewer wall, he heard a noise coming from behind him. Grey Fox spun in time to see two people walking towards him, not giving them time to react, Grey Fox threw two knives directly towards the hunters necks. The hunters collapsed, their truncated necks spewing blood and gore. It's a good thing you're evil, or that would have totally screwed your Good status. Either way, this left the Flayer exposed. He stood shocked for a second, then lunged toward the knife-thrower. Better to die with a full stomach! Grey Fox slipped into cloak once again, this time, he snuck behind the flayer (His helmet stops mind control and stuff) and materealized behind the Flayer, just intime to grab the arm and head of the Flayer and put it in a hold, "What say we work against a common enemy before eachother?" Grey Fox growled. The Flayer grumbled, forming the clumsy human words, as the man's helmet seemed to block his telepathy. "I do not... cooperate with lesser beings. That creature has no living mind, and no brain. It is of no use to me, it is only a threat. A threat which I am unable to conquer trapped down here in this abominable human construct." While the assassin was caught up in a fight, XAU-08-66 recovered and had got behind its target using its stealth systems. It suddenly attacked the distracted victim with both talons, aiming for the neck area and restricting movement. I'll add myself to the graveyard when I get to a decent PC. Congrats on the first kill, Griff!